With layouts tailored to your specific needs, you are sure to spend a lot more time in your new kitchen. Located in Leicester, Leicestershire, we provide seamless kitchen installations with bespoke designs so that your kitchen is unique. Along with providing Schüller™ kitchens, a range of highly regarded suppliers including Next 125™ are listed below for you. The philosophy and claim of next125™ is to design in harmony with nature and price and to create international design that is both moving and fascinating. Spacious and well-thought out in detail, their kitchens are at a surprisingly reasonable price. Keller Kitchens™ is a Dutch brand that is completely geared to your needs and wishes. This has many advantages, such as making use of the unique Keller™ Colour System that allows you to combine colours and materials to your heart’s content. Their designers ensure a collection that is always up to date by making use of first-class materials like thick wood-based panels and soft-close Blum technology for drawers and doors. Keller Kitchens™ inspect and test their kitchens many times in their own factory. The Quooker™ tap immediately disperses boiling water and is the new kitchen must-have. With a tap on the worktop and a tank underneath, this 100% Dutch invention is taking over the world. Bosch™ offer a full range of energy-efficient home and kitchen appliances including many Which?™ best buys. Neff™ do everything that they can to create an extensive range of quality kitchen appliances for you. Their appliances make life in the kitchen a daily pleasure by anticipating all of your desires and combining innovation and design, style, and versatility. Whatever you’re doing in the kitchen, you’ll find the perfect partner in your Neff™ appliance. Producing high-quality technology since 1925, BLANCO™ stands for excellent craftsmanship, first-class materials, and unbeatable designs. BLANCO™ mixer taps, sinks, and waste separation systems represent the highest quality, functionality, aesthetics, and professionalism in more than 100 countries all over the world. 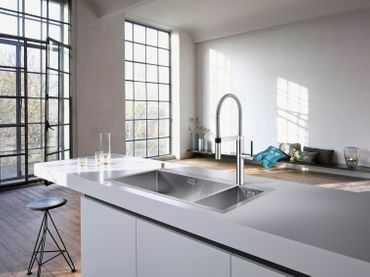 Franke™ is the world's foremost kitchen sink manufacturer and renowned for a commitment to quality and an unmistakable flair for design by using the finest materials and state-of-the-art production technology. Adopting a policy of investment in innovation and technology, Franke™ has established their position as the largest stainless steel sink manufacturer in the world and a leading name in kitchen taps, cooker hoods, and ceramic and Fragranite kitchen sinks. Contact us in Leicester, Leicestershire, to obtain more details about kitchen installations and Schüller™ kitchens. Monday – Friday, 10:00 a.m. - 5:30 p.m.
Saturday, 10:00 a.m. - 4:30 p.m.